Make a pure shot every time with our premium ball wipe pad. These now feature your favorite sports, second to bowling of course! Made of durable all natural genuine Buffalo Leather, the heavy knap of the Pure PadTM will effortlessly absorb dirt and oil better than any microfiber towel or shammy ever could. It's been specifically sized to fit in the palm of your hand, so right away you'll notice the texture and feel the difference in weight. Every time you use it, you'll be reminded that this isn't just another ordinary bowling towel. 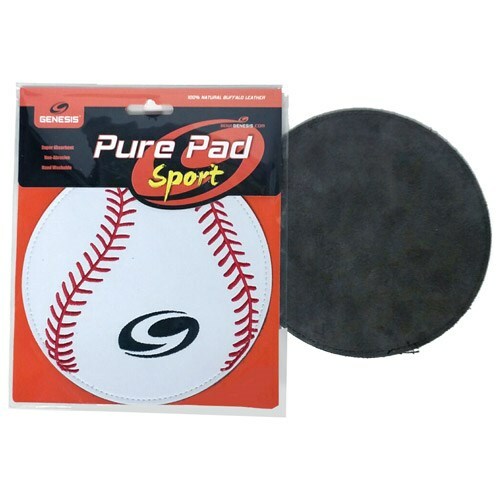 Due to the time it takes to produce the Genesis Pure Pad Sport Leather Ball Wipe Baseball ball it will ship in immediately. We cannot ship this ball outside the United States.